1) Mix everything together except for Fruits and Chocolate. 2) Add water till you have a solid, not too wet dough. 3) Add Raspberries (about 1/2 cup) carefully. 4) Pour everything in a baking tray (should be about 1.5 inch high with batter in the tray). 5) Bake for about 25 min at 170 degrees. 6) Take the cake out of the tray and let cool down. 7) Melt Chocolate in microwave (about 40 sec), stir well and pour over the cake. 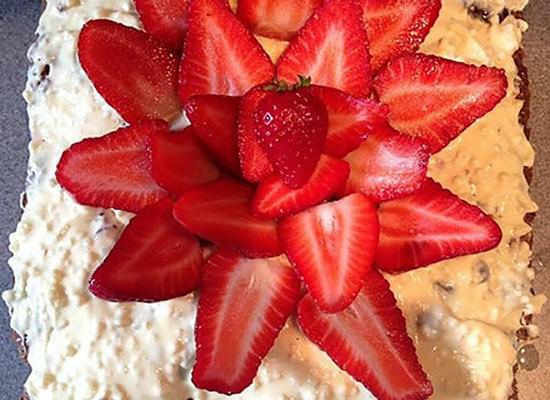 8) Decorate with Strawberries and indulge!